Last week I was invited to attend and speak at the biannual conference for the French organisation Le Club des Villes et Territoires Cyclables [Villes Cyclables], or Club of Cyclable Cities and Territories. It took place this time round in my favourite French city, La Rochelle, on the Atlantic coast a couple of hours north of Bordeaux. Over the past couple of years I've had the pleasure of meeting bicycle advocates from every continent. I've gone for bike rides with a couple of hundred of them [not at the same time] who were visiting Copenhagen and, more recently, I've met them while lecturing in a host of countries. No questioning the general passion and commitment among the bunch. What is unique about the French conference and organisation is that the membership includes 197 local authorities covering a whopping 786 cities and towns - plus four large regions and 30 organisations. It is a complete national affair. Their passion is no more or less than the other advocates I've met, but they are organised and that makes them stronger and more politically active. Much talk is heard of Paris' fantastic and ongoing transformation, thanks to the Vélib bike share programme, and rightly so. What is lesser known is that countless other towns and cities whose names you can't pronounce are moving briskly along in reestablishing the bicycle as an accepted, respected and equal partner in the traffic equation. It's a mind-boggling secret to suddenly become a party to. Think of the bike lift at the end of the brilliant Budapest critical mass and imagine that it is cities and towns doing the same. Meeting, discussing, brainstorming about how to increase the bicycle's modal share in the country. Fighting for safe, separated infrastructure across the nation and actually having numerous excellent examples in place already. 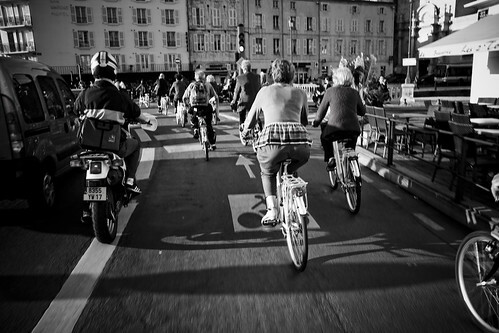 Actually, 23 million French citizens, or 40% of the population, regularly practice cycling, including 17 million who use the bicycle as transport. That's... um... 27% of the population, and while it's not daily, it's still awe-inspiring. According to an article in the French business newspaper Les Echos, the bicycle "sector" at large represents a turnover of €4.5 billion [$6.67 billion] and 35,000 direct jobs. The French even buy 3.5 million bikes each year and 36% of them are home-grown products. 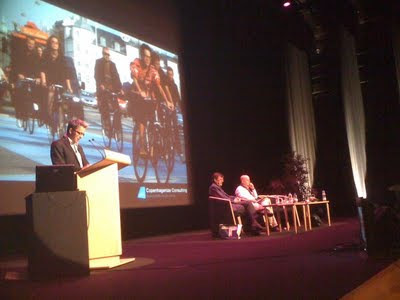 Villes Cyclables flexed their political muscle during the conferene, urging the national government to invest €500 million [$742 million] in the development of cycling as transport. The president of Villes Cyclables Jean-Marie Darmain called for €50 million [$74 million] over the next five years earmarked for surveying and signposting French cycle routes. He also called for €450 million [$668 million] to be spent on three areas: bicycle parking near train stations to promote intermodality, bike share programmes and the construction of bicycle infrastructure, particularly across metropolitan areas. Me, all I had to do was give a lecture about Marketing Bicycle Culture, although this time in French, and meet interesting people with whom I share common interests. Like the Mayor of San Sebastian/Donostia in the Basque Country. Like moi, he was also invited as a guest of honour. I told him how much I LOVE his new bicycle tunnel. He was modest about his spectacular efforts to transform San Sebastian into a bicycle-friendly city. Far too modest. For he really is a visionary. 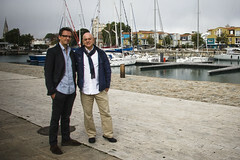 La Rochelle was the perfect city to host the event. As posted previously, the city was the first to launch a permanent bike share system back in 1975. The mayor at the time, Michel Crepeau, was inspired by Copenhagen's pedestrianised streets and did the same back then. He has always been one of my bicycle culture and urban planning heros. I was last there about 3 years ago but the change since then in enormous. Separated infrastructure abounds and the number of cyclists has exploded. It was already a bicycle-friendly city but now it's extraordinary. It was a great city in which to meet a national network of visionairies and I'm grateful I had the opportunity.